Pumpkin Applesauce Muffins with Maple Cream Glaze are a favorite breakfast choice at our house. Everyone loves this recipe. The muffins also freeze well (without the glaze) so make an extra batch to pull out on busy mornings…which is pretty much every morning, right?? 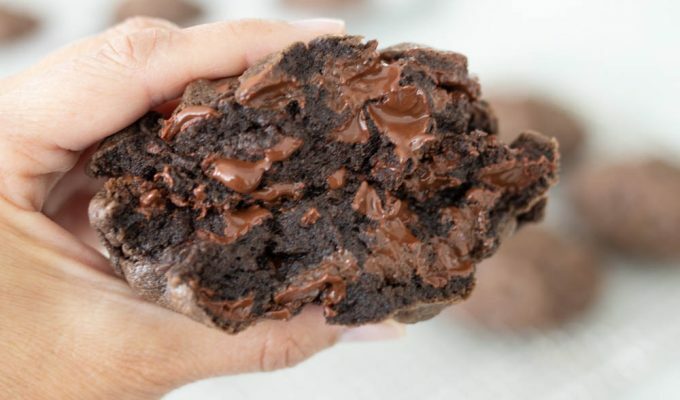 If you’re a Milky Way candy bar lover you have to make this cookie! What’s not to love about milk chocolate, caramel and pumpkin all squished into one heavenly cookie? Chewy Pumpkin Milky Way Cookies combine all of these flavors into one treat! Need a quick dessert to feed a crowd? Pumpkin Sheet Cake with Cream Cheese Frosting takes about a minute to throw together, and in about 30 minutes is out of the oven, and ready to cool and then frost. It serves a crowd and gets better with time. I like it best a day or two after baking! A pumpkin roundup can’t be complete without everyone’s Favorite Pumpkin Pie! This pie is my go-to pumpkin pie recipe. It never fails and has the perfect texture and amount of spice. I’ve adjusted the famous Libby’s pumpkin pie recipe so it’s never runny in the middle. If you shop at Great Harvest Bread Company, you know about their pumpkin chocolate chip bread. I became OBSESSED one year with making an at home copycat version of Great Harvest Pumpkin Chocolate Chip Bread. This recipe is the closest I’ve tasted to the real deal. Are you craving pumpkin bread, but have overripe bananas sitting on your counter? This recipe is calling your name! Pumpkin Banana Bread with Orange Glaze can be made ahead and frozen for days when you need a treat but don’t have time to bake. Make and freeze the loaves after they have cooled, when ready to serve, take out of freezer about two hours ahead and let thaw, glaze and serve. With the holiday baking season upon us, many recipes call for Pumpkin Pie Spice. Do you know that you can make your own at home and save so much money you’ll probably have enough for a pedicure?? Well, depending on the amount of pumpkin pie spice you were going to purchase… it’s quick and simple and I’m guessing you have most of the ingredients in your pantry. Coconut Pumpkin Bread. My friend Tessa gave me this recipe about 20 years ago and I still get recipe request every time I make it. The pudding in the batter makes this pumpkin bread unlike any other you’ve tried. And the coconut on top… I’m a fan! If you’re looking for a way to let the kids help in the kitchen, let them mix up a batch of 3 Ingredient Pumpkin Butter to serve with waffles, pancakes or rolls at your next dinner! Also really fun to spoon into jars and give as gifts. If I had to choose one pumpkin favorite it would be this Orange Pumpkin Bread. I’ve been making it for over 20 years and we still love it. Orange Pumpkin brad is moist and has a hint of orange flavor, which comes from the pj concentrate in the batter. Certain people in our home have been known to eat an entire loaf in a day. If you live anywhere near Bountiful, Utah, you know about Cutler’s Cookies and Sandwiches. Curt and his family have been making cookies since the 70’s and it’s my go-to when I want to pick up cookies when I’m out and about. Curt has shared many of their family recipes with me on ABK over the years. We love Cutler’s Pumpkin Chocolate Chip Cookies and if you can’t drive by and pick one up, you can make your own at home! If you’re addicted to Starbuck’s Pumpkin Spiced Hot Cocoa you’ll love this make at home recipe! It’s perfect for cool fall days. Warning. Highly addictive. Brunch and coffee cake go hand in hand. I love this breakfast cake with a cold glass of milk! Pumpkin Buttermilk Chocolate Chip Coffeecake is an any time of day treat we love. It’s a one bowl, mix, and throw it in the oven wonder. Pumpkin cookies. They’re the popular kid this time of year! If you want your pumpkin cookies to stand out from the crowd, you have to find a way to think outside the box. How about topping your cookies with lemon icing?? Once you make these, plain pumpkin cookies will never be good enough again. Pumpkin Chocolate Chip Cookies with Fresh Lemon Icing. Make some today!